For some PowerPoint projects you may find that you would like to line up elements in a certain way and that having guides on the slide would be useful. In the steps that follow, I will show you how to make guides visible and (because there is only one horizontal and one vertical guide that intersect in the center by default) how to add extra guide lines. Select Ruler from the Show area of the View tab. Most people who use the guides need things lined up at specific measurable spots on the slide. The Ruler will help with this. Drag the guide one direction or the other to change its position. Ensure the original guide is at its starting 0.00 position. Place the new guide wherever you would like. Be sure to release the mouse button first and then the [Ctrl] key. If you release the [Ctrl] key first the original guide will not be duplicated but will be repositioned instead. Note: To delete a guide, simply drag it off the slide. 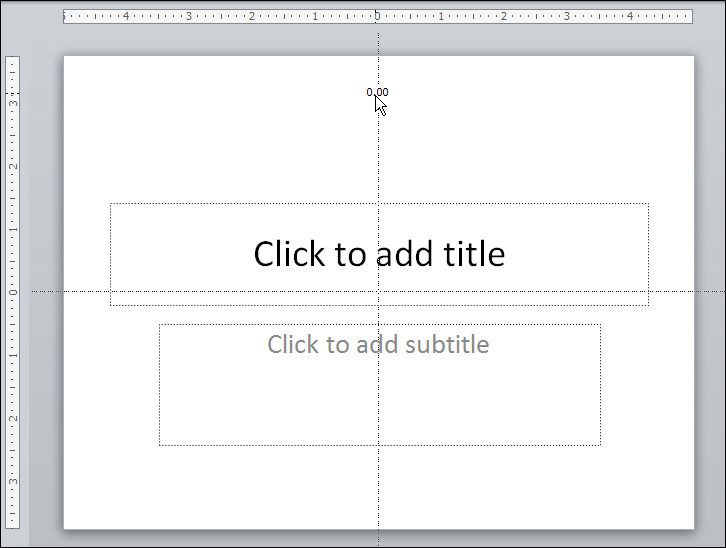 Another good point on guides (if you are using PowerPoint 2013) is that you can set them on your Slide Master as well...that way you won't accidentally drag them around in the normal view of your deck. You can also now change their colors in 2013, which is helpful if you are setting multiple guides across your presentation for your different objects. Thanks Taylor, I use 2010 so that's great to know. I'm going to try out the master slide guides in 2010 as well and see if I can do that.